I have quite a library at home for M to read - mostly books that I use to read as a kid and some that I have bought in anticipation of my kids reading (and hopefully) enjoying them as much as I did. Lately we have been going to the library to get Miss M books (and she takes out 2 books a week at school) but I am finding it quite a mission. (I don't know why... I have strange issues!) Lately I have been buying books online at take.alot.com but I find it expensive. To spend R80-R130 on a book that Miss M reads within a day (sometimes 2 if we are lucky!) is just too much. Soooo.... I decided to stop being lazy and go to my favourite second hand bookstore - Mega Books - and found these for R12-15 each! What a bargain! I haven't been there in a while because I read on my kindle but after today's bargain shopping I will definitely go back soon. I bought 8 books for less than R70 bucks. The even better news is, that they are still in such good condition. 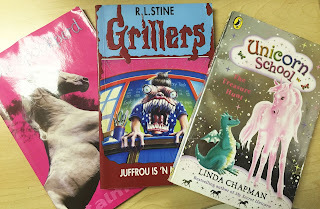 I am going to be the best mom in the world tonight when M sees that I found her a "Goosebumps" book in Afrikaans. Yay ME!